"In this paper, we offer a risk-based explanation of currency momentum profits by showing empirically that the high returns to winner currencies can be understood as compensation for dispersion risk, which, in our setting, is defined as innovations to the cross-sectional deviation in currency market excess returns. More precisely, we find that winner currencies load positively on innovations to cross-sectional FX dispersion and perform poorly in periods with unexpectedly low cross-sectional dispersion, periods in which loser currencies provide insurance by delivering positive returns. That is, the high return to winner currencies can be understood as compensation to momentum investors for the risk of disappearing dispersion. Our main sample of currencies comprises up to 48 countries as in Menkhoff et al. (2012) and our main results are based on momentum portfolio constructed by sorting currencies into five portfolios based on their past excess returns. Investing in the portfolio of winner currencies and shorting the portfolio of loser currencies yields large unconditional excess returns of 5.73% and 5.84% per annum for one- and three-month formation periods, respectively, after adjusting for transaction costs through bid and ask quotes. This high return is hard to explain using traditional risk factor, but can be rationalized using dispersion risk. We construct our measure of dispersion risk as the cross-sectional deviation across five carry trade portfolios formed by sorting individual currencies into five portfolios based on their previous period’s forward discount. Using this factor, we show that the observed heterogeneity in average net excess returns across currency momentum portfolios can be explained by their different exposures to FX dispersion innovations. Our key empirical results are as follows: i) We show that dispersion risk is priced in the cross-section of currency momentum portfolios, ii) has a significant positive price of risk, and iii) that dispersion risk is able to account for a substantial part of the heterogeneity is average momentum net excess returns. The cross-sectional R2 exceeds 96% for one month momentum portfolios and is about 66% for three-month momentum portfolios.Moreover, we find that sorting individual currencies, where currency excess returns are signed according to their previous periods’ excess return (referred to as conditional excess returns), into five portfolios based on their ex ante exposure to dispersion innovations yields a monotonically increasing pattern of average excess returns, corroborating the fact that investors require a higher premium for investing in currencies that are more exposed to negative dispersion shocks. We provide further evidence that markets trend on the medium term (months) and mean-revert on the long term (several years). Our results bolster Black’s intuition that prices tend to be off roughly by a factor of 2, and take years to equilibrate. The story behind these results fits well with the existence of two types of behaviour in financial markets: “chartists”, who act as trend followers, and “fundamentalists”, who set in when the price is clearly out of line. Mean-reversion is a self-correcting mechanism, tempering (albeit only weakly) the exuberance of financial markets. "In his remarkably insightful 1986 piece called “Noise”, Fisher Black famously wrote: An efficient market is one in which price is within a factor 2 of value, i.e. the price is more than half of value and less than twice value. He went on saying: The factor of 2 is arbitrary, of course. Intuitively, though, it seems reasonable to me, in the light of sources of uncertainty about value and the strength of the forces tending to cause price to return to value. By this definition, I think almost all markets are efficient almost all of the time. As far as we are concerned, we always believed that Black was essentially right, precisely for the argument he sketched: humans are pretty much clueless about the “fundamental” value of anything traded on markets, except perhaps in relative terms. The myth that “informed” traders step in and arbitrage away any small discrepancies between value and prices does not make much sense. The wisdom of crowds is too easily distracted by trends and panic. In Black’s view, prices evolve pretty much unbridled in response to uninformed supply and demand flows, until the difference with value is strong enough for some mean-reversion forces to drive prices back to more reasonable levels. If Black’s uncertainty band  was – say – 0.1%, the efficient market theory (EMT) would be a very accurate representation of reality for most purposes. But if  Black’s uncertainty band = 50% or so, as Black imagined, EMT would only make sense on time scale longer than the mean-reversion time TMR. For stock indices with volatility of 20%/year one finds TMR 6 years. The dynamics of prices within Black’s uncertainty band is in fact not random but exhibits trends: in the absence of strong fundamental anchoring forces, investors tend to under-react to news and/or take cues from past price changes themselves. This induces positive autocorrelation of returns that have been documented in virtually all financial markets. The picture that emerges, and that we test in the present study, is therefore the following: market returns are positively correlated on time scales <<TMR and negatively correlated on long time scales ~ TMR, before eventually following the (very) long term fate of fundamental value – presumably a biased geometric random walk with a non-stationary drift. We test this idea on a large set of instruments: indexes, bonds, FX and commodity futures since 1960 (using daily data) and spot prices since 1800 (using monthly data). Our results confirm, and make more precise, Black’s intuition. We find in particular that mean-reversion forces start cancelling trend following forces after a time around 2 years, and mean-reversion appears to peak for channel widths of Black’s uncertainty band on the order of 50 to 100%, which corresponds to Black’s “factor 2”. In a way, our results are very intuitive: mean-reversion comes as a mitigating force against trend following that allows markets to become efficient on the very long run, as anticipated by many authors. However, even highly liquid markets only equilibrate on time scales of years – and not seconds, as market efficient enthusiasts would claim. Title: How Do Short Selling Costs and Restrictions Affect the Profitability of Stock Anomalies? Short selling frictions cannot explain the persistence of seven prominent stock anomalies. Long-only investing is robust and profitable and can be further enhanced by using a synthetic short. Moreover, portfolios restricted to stocks that are easy to short sell continue to have large and significant short anomaly alphas. I derive cost bounds for switching between implementation methods and show that the cost associated with short anomaly positions is small relative to their profitability contribution using a proprietary database of borrowing fees. 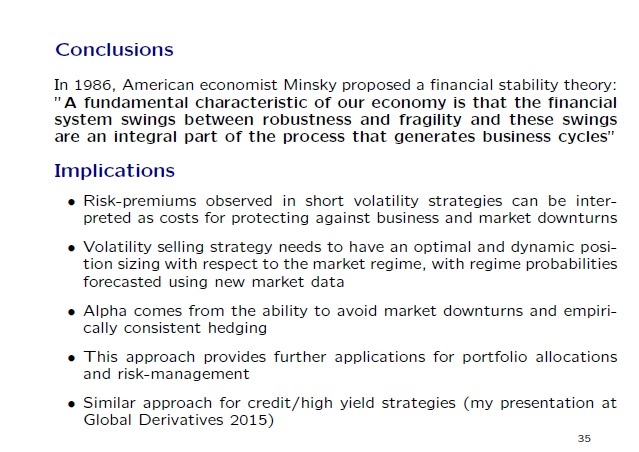 Overall, the empirical evidence does not support the implications of arbitrage asymmetry that mispricing is concentrated in short positions where it is too costly to exploit. "Historical tests of the CAPM have given rise to an abundance of anomalously priced characteristics in the cross-section of stock returns. Focus in academic work has been placed on the performance of zero-cost long-short portfolios. In practice, investment vehicles that provide anomaly exposure tend to be long-only. Evidence on the impact of short selling frictions on anomaly profitability is scarce. The goal of this paper is to fill this gap and explore the effect of short selling costs and short selling restrictions on the viability of anomaly investing. From the point of view of practitioners, the impact of short selling frictions is relevant as it can help determine the optimal approach to anomaly investing. Should strategies be executed long-only or long-short? Alternatively, can shorting the market, rather than shorting individual securities, be used to improve between anomaly fit and the performance of anomaly combinations? An explanation of anomalies grounded on arbitrage asymmetry implies two key hypotheses: (1) anomaly profitability should be concentrated in short positions and (2) capturing this profitability should be too costly. The paper finds evidence against both claims for seven prominent stocks anomalies. Extensive mispricing exists in long positions and short selling costs are avoidable and low relative to short position profitability. In other words, short selling frictions cannot account for the persistence of anomalies. The evidence is as follows. 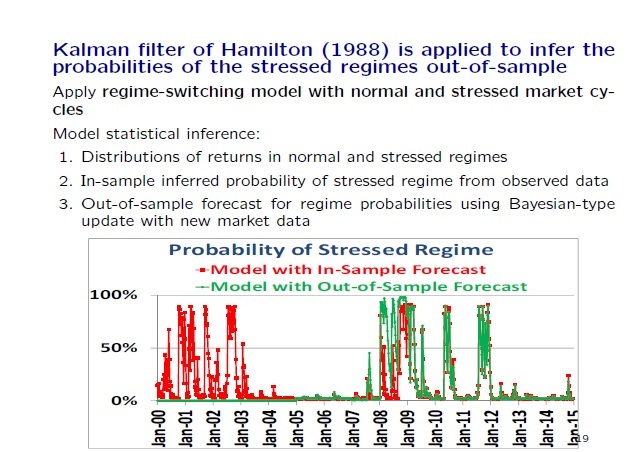 Time series alphas are large and statistically significant in long-only anomaly portfolios. Moreover, the inclusion of long-only anomalies to the investment universe leads to an economically large improvement in risk-adjusted performance in portfolio analysis. Sharpe ratios go up by 32% out-of-sample and 60% in-sample relative to a traditional passive investment in the market. The improvement is significant at the 1% level. The results suggest that there is significant profitability in long-positions which is evidence against the first implication of arbitrage asymmetry that anomaly profitability should be concentrated in short positions. Even investors who do not short sell (for whatever reason) can extensively improve performance by including anomalies to their investment universe. Is it necessary to short sell individual securities to exploit security overpricing and negative alphas? If short selling individual securities is impossible, how can we further improve upon long-only investing? In the presence of all-encompassing prohibitive shorting frictions on individual securities, the paper proposes the use of a synthetic-short strategy. 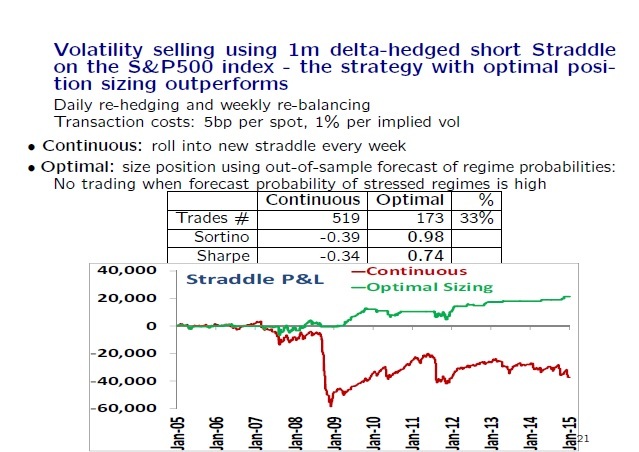 The synthetic bet goes long the highest alpha decile and an intermediate portfolio whilst shorting the market. The synthetic-short approach aims to achieve two objectives. First, it removes overexposure to the equity premium which otherwise dominates long-only investing. Second, the synthetic-short approach exploits negative alphas in overvalued securities. 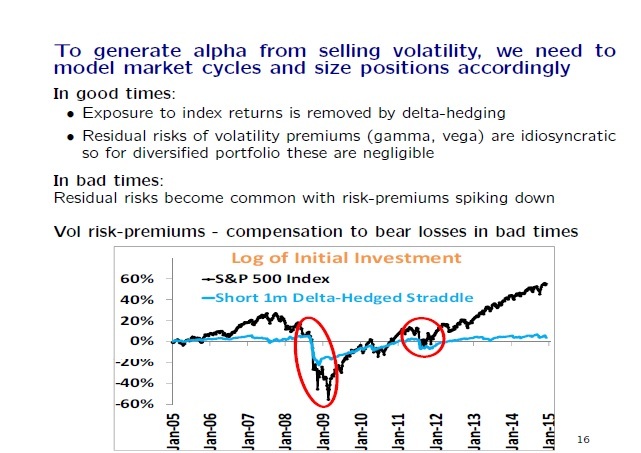 Ideally, investors want to buy positive alpha whilst short selling negative alpha securities. In practice investors can often only easily short sell the market. In other words, investors can only easily short securities in their value-weighted proportions. A long position in a positive alpha decile combined with a market short implies a net short position on all nine remaining decile portfolios. Taking a short position on the lowest negative alpha decile portfolio is beneficial. This is the standard approach in the unrestricted long-short setting. However, short positions in intermediate portfolios can be suboptimal. In properly priced intermediate portfolios without an alpha, short positions are just redundant bets that needlessly waste capital. More problematically however, intermediate portfolios can also have a positive alpha which can be harmful to strategy profitability. To reduce this risk, I include a positive weight in the second highest alpha portfolio in the synthetic-short. The goal is to reduce the net negative weight assigned to the second highest alpha portfolio in the overall synthetic-short strategy. The results show that using a synthetic-short improves Sharpe ratios by 40% out-of-sample and 80% in-sample relative to long-only investing. Improvements are statistically significant at the 2% level. The findings suggest that long-only investing can be extensively improved by using only a market short. The evidence goes against the second hypothesis as it shows that short position profitability can partly be exploited using a cheap execution method such as a market short. 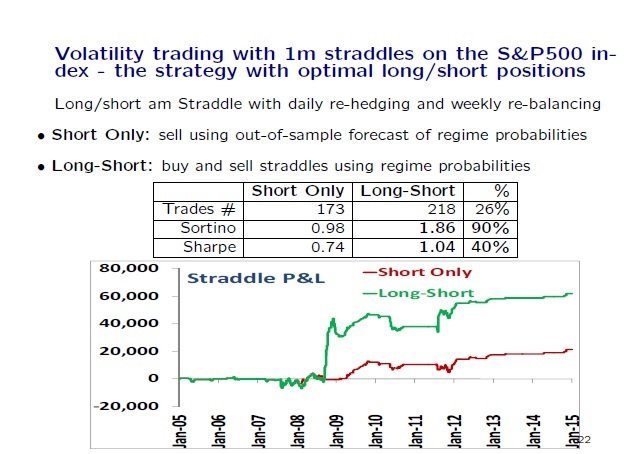 Short selling individual securities in the short leg of anomalies is profitable in the absence of shorting costs. 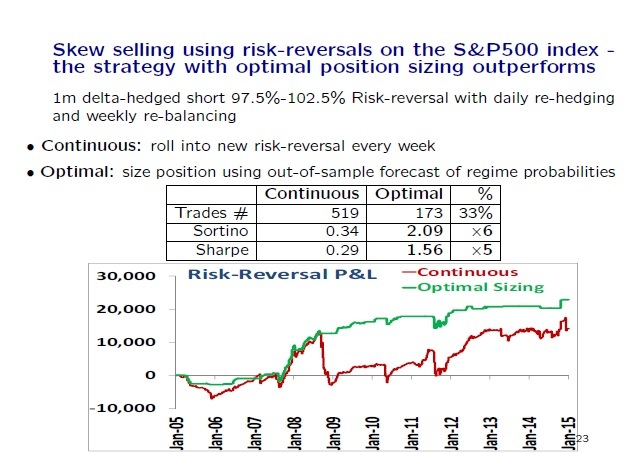 Short alphas capture 63% of long-short profitability. In addition, portfolio analysis shows that short selling individual securities improves the Sharpe ratio by 64% out of sample and 24% in-sample relative to the synthetic-short approach. Improvements are statistically significant at the 2% level (4% in-sample). Overall, the evidence suggests that short selling restriction on either individual securities or the market can severely reduce the profitability of anomalies. However, they do not completely annul their investment potential. We present some empirical evidence for short volatility strategies and for the cyclical pattern of their P&L. The cyclical pattern of the short volatility strategies produces an alpha in good times but collapses to the beta in bad times. 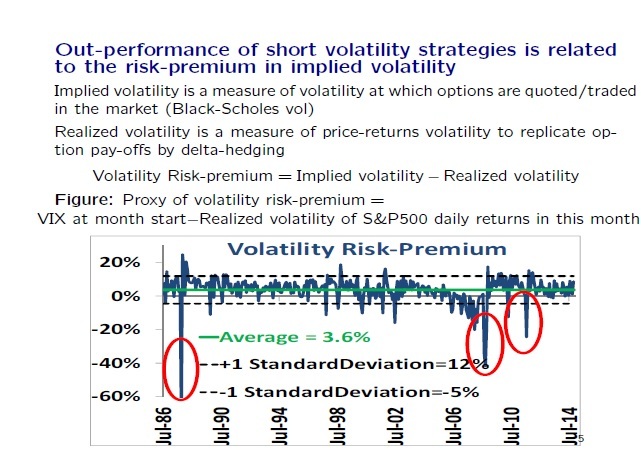 We introduce a factor model with risk-aversion to explain the risk-premium of short volatility strategies as a compensation to bear losses in bad market regimes. We then consider an econometric model for statistical inference of market regimes and for optimal position sizing. 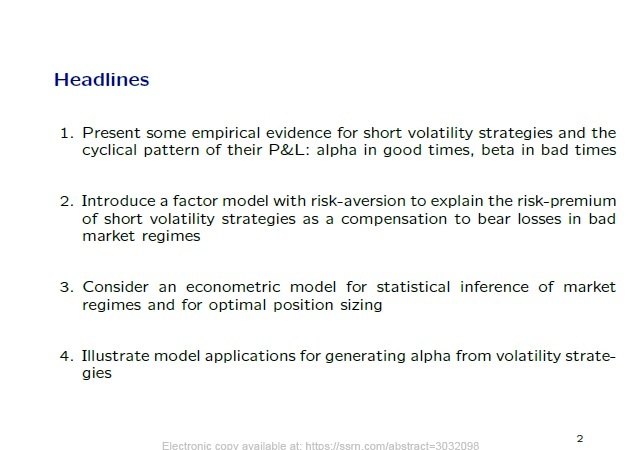 Finally, we illustrate model applications for generating alpha from volatility strategies. Title: The 'Size Premium' in Equity Markets: Where Is the Risk? "One of the best known – and perhaps most controversial – effects in the market folklore is the so-called “size premium”, which states that small-cap stocks are on average undervalued and outperform large-caps. But while still highly popular among equity managers, strong doubts about the very existence of a size premium have been expressed in a number of scientific publications. Here we want to advocate another, complementary picture. We argue that market capitalisation is not an optimal indicator of an otherwise genuine “size” effect. Indeed, the dependence of a stock “beta” on market capitalisation is non-monotonic, which induces spurious biases in a (market neutral) portfolio construction. The resulting SMB portfolios have a strong short Low-Vol exposure. We propose instead the average daily volume (ADV) of transaction (in dollars) as an alternative indicator of size, and show that the above mentioned biases are substantially reduced. The choice of ADV is further motivated by two independent arguments, often put forth in the literature. One is that the size effect might in fact be a liquidity risk premium, i.e., “Cold” stocks, that are more difficult to liquidate, are traded at a discount. The other is that heavily traded, “Hot” stocks are scrutinized by a larger number of market participants, therefore reducing pricing errors. Although these arguments sound reasonable, we will show below that they fail to capture the mechanism underlying the profitability of Cold-Minus-Hot (CMH) portfolios. 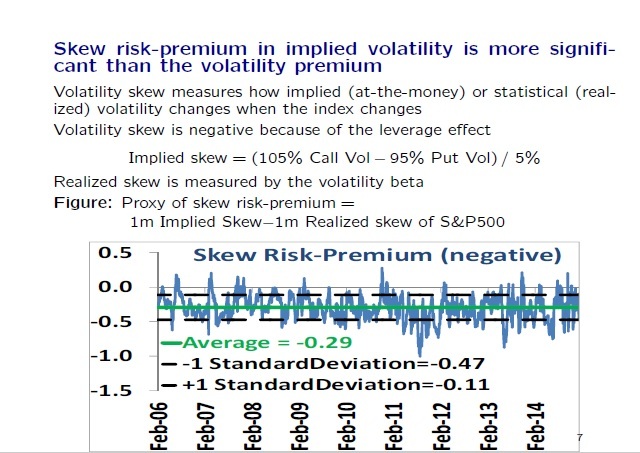 Perhaps surprisingly, standard skewness measures do not conform to the idea of that the size effect is a risk premium. In fact, the single name skewness of small cap/small ADV stocks is positive, and declines to zero as the market cap/ADV increases. At the portfolio level, small cap/ADV stocks do not contribute to skewness either. In fact, the SMB portfolio is only weakly negatively skewed, whereas the CMH portfolio is not skewed at all; furthermore, large gains/losses at the portfolio level mostly come from the short leg (corresponding to large cap/ADV stocks). All these results suggest that “prudence” (i.e. aversion for negative skewness and appetite for positive skewness) should favour small cap/ADV stocks, in contradiction with the idea that SMB or CMH are risk premia strategies. Interestingly, however, higher moments of the return distribution, such as the kurtosis or the downside tail probability, show a clear decreasing pattern as a function of market cap or ADV. In other words, extreme in both directions are more common for small stocks, even after factoring out volatility. Even if, quite unexpectedly, large upside events are more likely than large downside events for small stocks, “safety first” considerations might be enough to deter market participants from investing in these stocks. This scenario would allow one to think of the size anomaly as a risk premium – albeit a rather non conventional one."